ATLANTA, GA (June 30, 2015): David Weekley Homes has custom-built homes available in the Atlanta-area gated, golf course communities of Governors Towne Club and River Club, with several homes ready for immediate move in. Located at 98 Cuthbert Lane in Governors Towne Club in Acworth, the one-story Durrant is priced at $675,000 and features 3,002 square feet with four bedrooms, three full baths, one half bath and three-car garage. Additional spaces include a study, dining room, family room with corner fireplace, breakfast area, keeping room, retreat, private owner's retreat and covered porch. Two homes featuring the Hazelton floor plan are also ready in Governors Towne Club. These two-story homes have four bedrooms, three full baths, one half bath and a three-car garage. Entertaining spaces on the main floor of this home include a dining area, kitchen, two-story family room with corner fireplace, study, guest suite and owner's retreat. The second floor features two additional bedrooms, two additional bathrooms and retreat area. The home at 78 Cuthbert Lane is priced at $709,000 and includes a covered porch and overlooks the sixth green. The home at 4228 Tattnall Run is priced at 679,990. 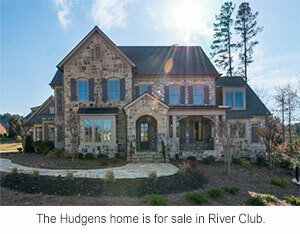 Located in River Club at 4862 Ipswich Glen, The Hudgens is situated on a nearly one acre homesite and is priced at $1,450,000. The home features 4,517 square feet and features five bedrooms, five full baths, two half baths and a three-car garage. The main floor includes an oversized Owner's Retreat, chef's kitchen with Wolf appliances and a spacious family room with coffered ceiling and views of a private outdoor space. The terrace level is unfinished, allowing the homebuyer to customize and design the space. The upper level offers an oversized media room and three large bedrooms, each with its own bath. The two-story Avonmore is located at 4388 Lochsa Lane in River Club and features 4,367 square feet with four bedrooms, four full baths, one half bath and three-car garage. This home features a covered front porch and an intimate terrace space with access to the first floor guest suite. The chef's kitchen overlooks the family room with fireplace and sloping ceilings, and a dining room with pocket sliders to a covered porch with fireplace. The Owner's Retreat includes a spacious walk-in shower, dual vanities, private water closet and two separate walk-in closets. The second floor includes two additional bedrooms, plus a children's retreat area and a media room with wet bar. This home is priced at $1,700,000. For more information about these homes, call 800-407-9150.